Doctor Who: DEEP BREATH Review | Warped Factor - Words in the Key of Geek. After the Cardiff Premiere, Tony Fyler wrote our spoiler-free review of Deep Breath. Now at last, we’ve ripped the tape off his lips. Warning: Contains spoilers. If you haven't seen Deep Breath yet you may want to come back later. When the actor playing the Doctor changes, it doesn’t always follow that the tone of the show changes with them. But Steven Moffat and the team are clearly keen to shake up the tone and the format as often as they can productively get away with. The birth of a new Doctor is as good an excuse as any, and from the very outset, the tone of Deep Breath is about more than the change of Doctor. It’s not about a girlfriend and boyfriend giggling through time and space, but about an old man and a young woman coming to terms with life, death, change and each other, against a background of harsh cosmic and psychological realities. This is no fairy tale – this is Doctor Who as therapy session. If that makes it sound dreary, strike the notion from your minds immediately. There are some naff elements in Deep Breath – the opening scene, and indeed the whole reason for the Tyrannosaurus being there, and then (to use a Douglas Adams riff) suddenly not being there any more feels laboured and dubious, the Paternoster Gang are more and more in danger of looking like Steven Moffat begging the BBC for a spin-off every time they appear, and it’s doubtful anyone ever wrote to the Production Office to say “Please, please, please – more of the Clockwork Droids!” but all of this is magnificently unimportant. Deep Breath is about the new Doctor and Clara in equal measure, each coming to terms with the change that’s taken place, how they feel about it, how it affects them and how – if at all – they are going to get on together going forward. Capaldi’s first explosion onto the screen with a magnificent “Shush!” and a slam of the door answers the question we’ve all been wondering for months now – if you were going to sum up the Twelfth Doctor in a single word, what would that word be? Is he a warrior, a survivor, a manipulator, a chatterbox? No – say hello to the Schoolmaster Doctor. His first five minutes of post-regenerative gibber is there mostly to give Capaldi some comedy, but also sets up some important elements: he sounds Scottish to us because to him, everyone else (except Vastra) sounds English. Clara is notsomuch an enigma wrapped in a question wrapped in a jumper that’s just slightly too tight as she is ‘Thingy, the Asking-Questions One’. This Doctor is instantly (and some would say believably) more alien than either of his two immediate predecessors. There’s an air of the pre-Rose Eccleston about him, an air of ‘I couldn’t give a stuff what you think, you’re just a human.’ He collapses, and cue credits. And can we just bask for a moment in those credits? The theme’s had a stripped-back, 80s, vaguely Dominic Glynn makeover, which presumably seemed like a good idea to someone, matched to a Doctor in Doc Martens. It’s entirely possible though that, while they began in the mind of a fan on the internet, these are the credits that Steven Moffat has been topping episodes with in his mind since 1975 – dark, incredibly complex, and (and please Rassilon let this be the last time this phrase is used in anger) timey-wimey. They instantly tell us that the Fairy Tale years are over. We’re in more grown-up territory now. The Doctor – like almost half his predecessors – is packed off to post-regenerative bed, but it’s barely minutes of screen time before he’s up again, pulling a Pertwee, being weird and brilliant, eschewing the door as too boring, climbing out of a window in the middle of the night, liberating a horse and riding off into untold danger. If we assume that the Eccleston Doctor wasn’t immediately post-regenerative when we first met him, it’s the most effective and action-packed debut since at least Tom Baker’s, and possibly even Pertwee’s (Pertwee had a wheelchair chase, Capaldi a horse ride). If we remember that Peter Davison faffed about collapsing at every turn in Castrovalva (and there were a lot of turns in Castrovalva) and Matt Smith, the youngest Doctor to date, spent a good ten minutes demanding to be fed immediately after his regeneration, perhaps it’s time to put the concerns over Capaldi’s age to bed now. They’re tired and they deserve a rest. That said, it becomes quickly clear that Deep Breath is paced more as a psychological puzzle than an action movie. It gives Capaldi time, perhaps ironically, to breathe into the character. He plays the post-regenerative struggle for identity with a straighter bat than anyone since Tom Baker too – he’s confused and gibbering for maybe the first third of his debut story, culminating of course in the powerhouse scene with the tramp, where almost all we know of the Twelfth Doctor so far is showcased – the comedy – “I’m Scottish? Ah, good, I can complain about things”, the philosophical musings on his history, the self-mockery – “these are attack eyebrows”, the hardness in pushing for his own way – “give me your coat”. The humour of the Twelfth Doctor seems not to come so much from his understanding of the universe, as with the Tenth, or his pretending to understand the universe and getting it wrong, as with the Eleventh, but from his complete failure to understand the universe and its stupider conventions. Once this frenetic, intense, funny and almost entirely wonderful scene is over though, the pace winds down, and the Twelfth Doctor is reeled in in terms of performance. When he meets up with Clara at the processing restaurant, he’s in quietly intense Sherlocking mode – spotting the thing that stands out and forcing a reaction. When they are taken down to the larder, there’s more evidence of this Doctor’s alien nature as he leaves Clara to fend for herself on the grounds that it makes no sense to have them both captured. But this Doctor’s not post-regenerative anymore; he’s just being cunning - minutes later, in a nod to Eccleston, he grabs Clara’s hand and they’re off, though not before there’s a corollary of a Matt Smith moment – “Tell me the whole plan!” the Eleventh Doctor once demanded, reflecting that “One day, that’ll work.” Here, the Twelfth thanks the Half-Face Man for his ludicrous explanation of the whole plan. That explanation of course is ostensibly given to Clara, who is forced to show her grown-up nature in this story more than any that have come before. The thing about Clara is she’s always been responsible, gutsy and have-a-go – governess Clara, entertainment officer Clara, nanny Clara and teacher Clara – but the combination of Clara and the Eleventh Doctor always had a tendency to infantilise her, to make her the Impossible Girl, rather than a particularly believable woman. But here, in her banter with Strax, in her heart-to-heart with Jenny, in her fiery confrontation with Vastra, in her standing up to Half-Face Man, and ultimately in her last long scenes here with New-Face Man, Clara shakes off the Impossible Girl and becomes, finally, Clara Oswald, ready to take her place in the universe as a grown-up. These are five fairly long scenes, given room to develop and grow – more evidence of the change of tone and pace in the show, and rather welcome too. The villainy here is very peculiar – as we said, no-one clamoured for the return of the Clockwork Droids, but by being generally a bit naff and stupid, they’re excellent at two things: delivering satire and allowing for character development. In The Girl in the Fireplace, they were essentially a satire on rigid bureaucracy – they have an idea, and they stick to it, and people get killed when they get in the way, because the idea cannot be wrong. Here, they’re a properly Doctor Who stab at organised religion and dogmatic belief – their quest for the Promised Land being the reason that presumably, over time, millions of people have died. Here though they do get a deepening – there’s something so pathetic, in the true sense of the word, about their mission, their belief, their desperate goal, that they make us feel sorry for them (and indeed, for their real world analogues who believe in killing people to get to Heaven), while still abhorring what they do in pursuit of that goal. And as a vehicle for character development, they can’t be beaten. They’re something to be going on in the background, and something to be puzzled out, by a Doctor discovering himself all over again, and a companion finding it hard to adjust to the change. There comes a moment in any regeneration story where the new Doctor reveals what he’s going to be like in a sort of mission statement. Tennant had “no second chances,” Smith had “basically…run.” Capaldi’s coup de grace is breathtaking, all the way from the pulled in, intense offer of a drink before he has to kill Half-Face Man, through the verbal battle, through the physical confrontation and the growling affirmation of the value of humanity, to the potential but unconfirmed double-cross that leaves Half-Face Man falling to his “death”. It’s a statement that the new Doctor is a more grown-up, darker, more complex man, and at the risk of being obvious, it makes you take a deep breath. Then, perhaps at the moment of its greatest potential, the episode chickens out a little. There will be plenty of fans who punched the air during the phone call from the Eleventh Doctor, but tonally, it’s a misstep. The new Doctor has proved himself to us in all his alien brilliance, but the production team uniquely decide to dial in a performance from the immediately previous Doctor, because without that touchstone to the old, Clara can’t accept the new. It feels like the episode loses confidence in the fact that it’s sold us the new Doctor, and it’s a moment that, while fans may love it, actually weakens the delivery of the new Doctor overall. But with the enforced softening of attitudes and an appeal to Clara’s caring nature comes acceptance, and there they go, the Schoolmaster Doctor and his schoolteacher assistant, off to spend some time together and get acquainted all over again. Except of course it’s not quite over. For those who thought such things had died a death – surprise! There’s a Moffatt story-arc starting up right at the end. It’s the Gatekeeper of the Nethersphere, talking about “her boyfriend” having defeated the Clockwork Droids. We wonder of course, predictably, about River Song, but more likely, there’s an altogether more twisted Moffatt explanation lying in wait for us over the next twelve weeks. Overall, an ending that’s intended to spark us into desperate speculation falls rather flatter than most of the episode onto which it feels somewhat bolted. Deep Breath has delivered a re-trodden monster story with some solid satire, but more than that, it has delivered a blinding double-hander for Capaldi and Coleman, stamping a new identity onto the show we know and love and demanding our attention all over again. The Twelfth Doctor has arrived: We have reached the Promised Land. 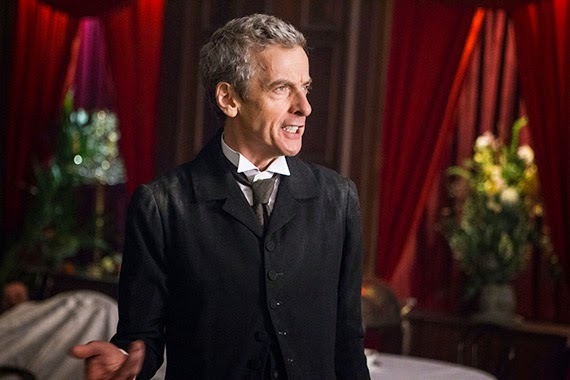 So what did you think of Peter Capaldi's debut adventure? Share your thoughts in the comments below.